The other day I came across a picture called the most beautiful horse in the world. It blew my mind. Look at the photo below and I am sure you will agree. The majestic stance and the golden coat is pure beauty. More to the point, my interest had spiked because the picture said the horse lived in Turkey! “Eh?” was my first response. I was quite surprised because Turkey has not been known for its excellence of horses since the Hittites bred pure stallions in the region of Cappadocia hundreds of years ago. My experience of horses in Turkey is mostly like the picture below. 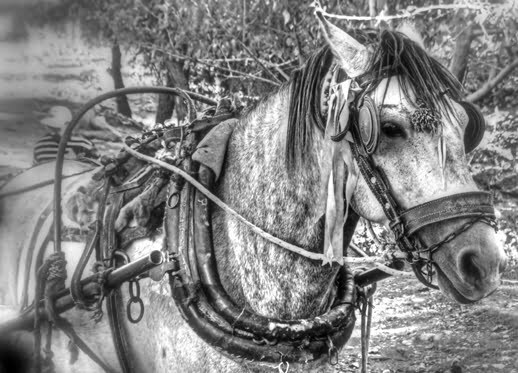 They are favored as working horses, sometimes flee ridden and displaying every single rib through their thin and skinny frames. Correction. I did go to the horse races in Izmir once but never got the impression that horse racing is taken seriously in Turkey or that the trainers and jockeys are on the same professional level like they are in the UK. I have also seen horse safari tours advertised in Karakoy and Cappadocia and while the horses looked healthy enough, none of them was particularly eye catching. So anyway, I imagined that this horse must have come from another country and suspected some digital enhancement on the photo. By now, I was starting to wonder if I was wrong. Maybe this horse was real and maybe it did live in Turkey. I wanted to see it with my own eyes. I wanted to write about it and show it to my readers. That is when I had to come back down to earth with a bump. The horse is real. As well as being known for its beauty, the breed is renowned for its strength, speed, and endurance. But it does not live in Turkey. Readers question : Did you already know about this hoax? The horse actually has a roached mane which is common for Akhal-Tekes since their manes are rather shabby if not cut. Most of the akhal-tekes at the stables I ride at have had roached manes with the exception of a few whose manes were usually braided. Regarding the weird head shape, it’s just a very typical Akhal-Teke head which I’m a complete sucker for- being obsessed with light-type horses like Akhal-tekes, Thoroughbreds and Arabians. Akhal-tekes originated from Turkmenistan and are spreading fairly quickly. They are well known in Russia as horses for Show-Jumping and racing. In Turkey they are considered horses of royalty but also used for every-day riding and lessons. That isn’t to say that the Turkish take horses less seriously or that trainers and jockeys are not on the same level as the British. While the English concentrate on their Thoroughbreds, Turkey and other Eurasian/Asian countries treasure their Arabs and horses such as Akhal-Tekes. And while Brits are very serious about their ‘Health and Safety’ these countries take riding equally as seriously but not that aspect of it. Instead they put all their trust into their horses, no matter how hot-blooded, and have a great time together with the horse. That is not going to say that everyone takes the best care of their horses but that’s also not the case in all countries. It really depends on every stables you go to since each one of them will be different. I think you mean the breed, not the horse? Actually this horse lived in Turkey once. Turcomans was using this horse. But nomad life style has ended. And this horse is gone from Turkey now. Sorry for bad english. Do any of you people have mirrors at home? I’m taking it none of you have perfect conformation, fantastic heads, leg length, perfect ball sacks etc etc. I mean, really!!! Who cares where this horse lives? To bad it’s not in my barn. This horse does’t live in Turkey, actually it lives in Russia, St.Petersburg. I don’t know from where you got this information. Horse was born in Turkmenistan and then then was given as a gift. 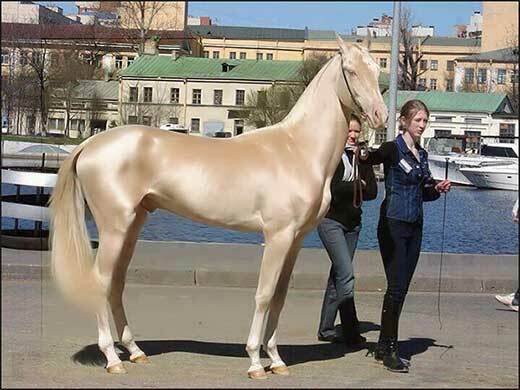 Name of the horse is Altyn which means Golden. If you really want to see horses this beauty I would recommend you to come to Turkmenistan. Why must some of these posts be so fictionalized? If the horse is from Russia, say so! Why not give more details? What is the breed of horse? What is its parentage? What would be its talent? Is it merely a show horse? I certainly have seen none so eye catching! That scraggy one smells awful as well! I’m pretty sure I saw camels in Harran, near Urfa, too…. I never said it can’t live in Turkey, I said Turks are not well known for breeds of horses. Not like Abu Dhabi anyway. The Turks can not be good at everything. No nation is. No one thinks that Turkey is just about Kebabs, harems and camels either. A few examples off the top of my head. If you read through my blog, you will see all these statements. Think you are being very harsh to make a snap judgement about me based on one article. Also maybe it is just a misunderstanding in your English but camels do exist in Turkey. I have seen them in Cappadocia and in Didim. Did you mean camels were not inherently from Turkey? No one thinks they are superior either, it is simply called noting observations. I too could write a whole book about the comments that Turks make about England. I believe it is braided and laying on the far side of the neck where you can not see it to wellitlooks that way to me . ‘Tis a Christmas horse! On the subject, have a good one, Nat! The colour is quite eye-catching, but there’s something about the shape of the head that puts me off. Then again, perhaps it’s just that my horse tastes run differently – I love Andalusians, Friesians and Gypsy Vanners, all horses with generally heavier builds and lots of hair. This horse doesn’t really fit that mould so, while beautiful, it’s not for me. . . come on, Natalie – it’s beautiful! It doesn’t matter where it lives – here in Turkey they would have buried it under a 4-lane highway or concrete by now just like everything else of beauty!